April 27 marks an important event in the city of Lapu-Lapu, specifically, and for most of the Philippines, in general, Today is known as the Kadaugan sa Mactan - Victory in Mactan - the day that is considered by most Filipinos as the first successful act of defiance by a Filipino against a foreign invader. Today commemorates the defeat of Magellan at the hands of Datu Lapu-Lapu of Mactan. The names Datu Lapu-Lapu and Ferdinand Magellan are perhaps two of the names that majority of Filipinos will never forget among the the pantheon of Filipino heroes and martyrs. Aside from the Philippine National Hero, Dr. Jose P. Rizal, Lapu-Lapu remains one of the few historical figures that Filipinos are proud of. After all, the story of the conquistador Magellan's death at the hands of Lapu-Lapu (or one of his men) is a story that is etched forever in the heart and mind of the Filipino people. And yet no matter how enduring the legacy of Lapu-Lapu is he also remains one of the heroes in our history to have an incomplete story. Little is known about Lapu-Lapu's beginnings. What we now know of him comes from Antonio Pigafetta's account of Magellan's voyage and eventual death in Cebu. After the Spaniards left Cebu following the death of their leader we know nothing about what became of the country's first hero. In fact, it is not even clear if his name was Lapu-Lapu or Caliph Pulaku. The latter name would indicate an Islamic root, and some historians have alluded to the possibility that Lapu-Lapu was a Moslem. Pigafetta's account calls him Cilapulapu, which, in my opinion, is actually "si Lapulapu" thus making his name Lapulapu. Despite the scarcity of records we can still piece together the life of Lapu-Lapu based on oral traditions. Various articles and essays have been written about him with stories taken from families claiming to be descended from Lapu-Lapu. The Pagobo and Baring families of Mactan and the Mundo family of Borbon, both in Cebu province, claim that they are modern-day blood relatives of hero of Mactan. Other oral traditions gathered through the years from various local sources have actually yielded more or less the same information as those coming from the families claiming to be Lapu-Lapu descendants. In one online article it is said that Lapu-Lapu's father was called Kusgano and his mother was Inday Puti (clearly symbolic names, as Kusgano stands for strength while Puti pertains to purity). He also appears to have a brother called Mingming and a grandmother called Matang Mantaunas, said to be a very powerful ruler in her heyday. Later, Lapu-Lapu is said to have married a beautiful princess by the name of Bulakna (flowers), the daughter of another local chieftain. Their child was called Sawili and was said to be as brave as his father. I also checked academic write-ups and found two. One was written by Heidi K. Gloria and the other one by Linda Kintanar Alburo. When I was working for UP Cebu's research arm way back 2002 I also read a research by one of my former professor, Ms. Fe N. Reyes, about Lapu-Lapu based on folklore. It is from their write-ups that I base this brief genealogy of Lapu-Lapu. According to the tales gathered by these writers, the tales about Lapulapu have unearthed a circle of names related to him, among them: Datu Manggal, his father; Matang Mantaunas, his mother; Malingin or Mingming, his daughter; Bulakna, his wife; and Sawili, his son. And while we would expect these oral traditions to put Lapu-Lapu at the forefront of the stories it is apparently Lapu-Lapu's father, Datu Mangal, who appears as the "lead" in most of these tales. These tales also appear to have better sources than the one earlier mentioned above. These stories do not only tell about the quests Lapu-Lapu had to undergo in order to win the hand of Princess Bulakna, it also tells of the magical tradition that was apparent in the members of Lapu-Lapu's clan. Accordingly, Lapulapu possessed supernatural powers because of his father Datu Manggal’s anting-anting or talisman. Of course, no one was more powerful than the father as he also possessed the power of foresight as well as having a horse that could fly. But back to Lapu-Lapu. Oral tradition states that though he successfully defeated Magellan, Lapu-Lapu did not come out of the battle unscathed. In fact, he had a serious enough knee wound which made him weak. Later, after a great whirlpool in Mactan, a miracle of the Sto. Niño restored the island and reconciled Lapulapu with Humabon. Oral history further states that five months after the battle of Mactan, Lapulapu asked Rajah Humabon to help him return his family and himself to his native home, which apparently was Borneo. In the end, Lapu-Lapu left Cebu with three wives, eleven children and, twenty servants. His warriors and other followers to given to Rajah Humabon as a parting gift. But there is also a more romantic end to Lapu-Lapu's life. It is said that sometime after the battle of Mactan, in his twilight years Lapu-Lapu and Bulakna decided that the time had come for them to leave the world and go on to the next. After making sure their son was ready to rule Lapu-Lapu and Bulakna entered a sacred cave and were never seen ever again. In the future I would be adding an article on "possible" Lapu-Lapu descendants. While this would be hard to verify historically it would still be good to trace the genealogies of these families claiming descent from Lapu-Lapu. Hi my middle name is Lapulapu. My mother said my Lolo hailed from Mactan and migrated to Negros island as a sacada in an hacienda. I hope Lapulapu's descendants could be traced. 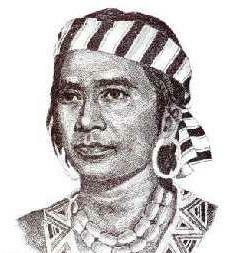 Hasanodin Gayak, Lapu-lapu was a Pintados or Visayan, which was not a Muslim tribe. Sorry, but you need to check on an Unbiased History Lesson. lapu lapu is indeed not a muslim, before they ate pork dog meat and drink palm wine. Hi! My grandmother's maiden name was supposed to be Lapu-Lapu but was change instead into Campos to escape from the people of Mactan and migrated to the Negros Island, specifically Cauayan, our family (you can call it a clan) speak mostly Cebuano so I asked about it and they told me about our ancestors. I really hope its true. Our lolo told us about our great grandparent was LAPU-LAPU but it was being changed to several family names including ours after the fall of magellan. There were at least 4-5 family names I recalled. Baguio, cabahug, baring and I forgot the others... He even had a family tree but so sad we couldn't find it anymore. My aunt says that we are also descendants of Lapu-Lapu as a Caña family in Cebu and was changed into Cañosa,Cañares,Cañado,Gabisan and many others.Hope that some are replying this. We are moros or pagans before the spaniards brought christianity in the the Philippines. We are the great maharlikan country. Philippines got its name from King Phillip. Nope, SiLapuLapu belonged to the Pintados clan, not Moros. Pintados? may be you read it to Wikipedia not really well cited source. Hi, my middle name is Lapulapu. My mother told me that we were Lapulapu's descendants. I made a research myself but the results are crude and blurred to me. My other relatives said that Lapulapu's tribe was not located in Mactan Island as what historian Gregorio Zaide wrote in his book. 1. Mactan has no single spring of water in the entire island so how could Lapulapu and his people survive in an place without water. 2. There is a place called "Matan" in Camotes Islands, where springs of water are found and artifacts of the Battle between Spaniards and the natives were excavated such as rusted cannon balls, shields and swords of European origins. 3. In Camotes Islands we we can easily find tables made of hard durable wood of antiquities and yet the island never grows trees of very hard quality. 4. In Pegafetta's record, when Magellan sailed his galleons to fight Lapulapu it was written that they sailed in early evening with favorable winds and reached the island in early dawn. Ergo: How come Mactan Island today is disclared by historians as the place of Lapulapu where it can be easily reached by a simple paddled boat in an hour from Cebu main island? Interesting. You should write further and explore this. My relatives said my family from my father side descendants is also lapu lapu, my grandfather and my father also from cebu "BOOC CLAN"
and "PULANCO CLAN" sabi nila iniba nalang ng mga ancestor namin yung mga Surname nila (apelyido) because they're afraid of Spaniards..
MACTAN until this day is inhabitable but a subterranean cave from Guadalupe Cebu to the Island is known. The Mangangatangs or Pirates doesn't live in the island but rest and just observe the trading in the nearby Cebu that passes by. Perhaps I've been to Camotes Island and their are errors and inconsistencies in our history like LIMASAWA island is really MASAU island the first Mass held in the delta river of BUTUAN CITY written by PIGAFETTA as MALHOU traced by its lattitude in the diary. Butuan then was bustling City. Lapulapu was named after a fish because it is said that he incurred a skin disease like fish scales. He was a Mangangatang in the Celebes Sea in present day Indonesia. Piracy was his living. Si Lapulapu is proper name for leaders like Sir from the SRI VISJAYA empire. I disagree that their are surnames during that time. The people of Bohol were given the incentive by the Spaniards not to Hispanize their family names like Calungsod, Cabatingan, Duhaylungsod and any Visayan sound name.While Family names with first names as surnames like MARCOS, SANTIAGO, SAN PABLO, ELEAZAR came from the north or Luzon. When I asked UNIVERSITY OF SAN CARLOS historian Mr. Pacaña and my uncle Dr. Momoy Fernan Bercero of Palompon State University, which comes first the Lapulapu fish or hero? They replied the fish. It is common for us to name names after animals. SILAPULAPU like Sir Lapulapu from SRI VISJAYA empire incurred a skin disease like fish scales with reddish skin most probably PSORIASIS. My grandmother's great, great, grandfather is Lapu-Lapu. My grandmother's surname was Lapu-Lapu, but it was changed to Esnardo because the Spanish went to their house in Cebu and asked her father to change their last name in Spanish or else they will die. But we have a lot of relatives here in Davao City whose last name is still Lapu-Lapu. They didn't change it. i believe that Lapulapu (Caliph Pulaku) was a Muslim, so was Datu Maktam (in Muslim origin, Makhdum). Over the centuries, Makhdum was mispronounced as Maktam, hence the name Mactan. Many families claim to be descendants of Lapu Lapu, including mine, the Patalinghugs of Mactan. Similar to what has been posted here, my family's version of Lapu Lapu's genealogy is his children taking up different last names to escape Spanish persecution, which actually is not a far fetched possibility considering the extent of the Spanish authority and military capability during that time. I would assume that there were a lot less people during that time than there are today, and there could have been a 99% chance that everyone must have been related to each other, which would make native Visayan families genetically related to Lapu Lapu. Knowing that there isn't a piece of literature to verify every claim of relation to Lapu Lapu, I would go to bed thinking that indeed, I am a descendant of our great hero. I advise to have DNA for all of the claimant to be lapu lapu. thats a wise decision. I could still remember that when I was a young boy my grandmother, Elena Entong Robles, annually receives an invitation from the local government of Cebu to attend the April 27th celebration of the Kadaugan sa Mactan. She was among those are recognized as a direct decendants of Lapu-Lapu. Free round trip tickets are also provided courtesy of the Philippine Airlines. My mother said we are the fifth generation of lapu-lapu's direct descendants, her Father who is my Lolo was born in Cebu. Lapu-lapu was originally from Opon, now known as Lapu-lapu City, one of her older sister (my aunt, deceased) can really tell the stories of what really happened during Lapu-lapu's reign. They change their last name to evade the spaniards, they change it to DIAZ, my mother's maiden last name. Per research Lapu-Lapu knew queen of Sheba in the Bible which means cebu, so he was a oneness God believer not a muslim. Therefore the Lapu-Lapu one those royals that know God very well in addition hindi sila nakabahag they were royals. In addition, my great grandfather was from Opon and Medellin Cebu and said Lapu Lapu was his relative also. In my opinion, the history of this great people Lapu Lapu is twisted and majority of Philippines history was erased by spanish friars. Spanish friars hide the truth regarding Ophir also known Philippines. Watch Solomon’s Gold in Youtube this documentary is compelling and the researchers cited very well to prove their argument.